Whole NEW Range of Toys! 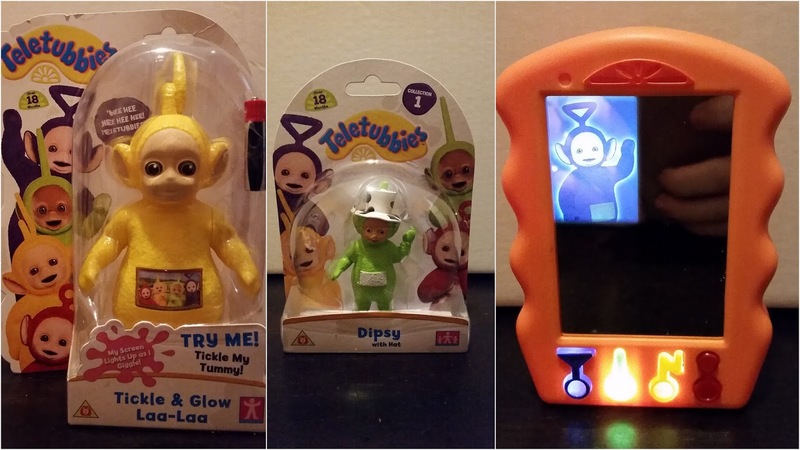 The Teletubbies are back and with the help of Character options there's a whole new range of exciting Teletubbies toys to go with them. We're so excited to reveal them to you today! 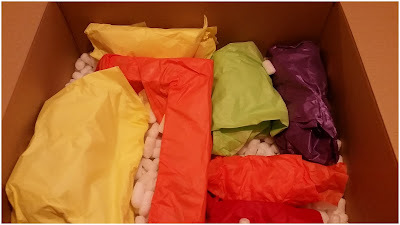 Last week we were sent with a secret selection of the brand new toys hidden inside. I wasn't able to show you what was in it then but today I can and I can't wait - Who's excited? The picture above shows what the contents looked like before we unwrapped them and the one below shows what they looked like afterwards. I had three very excited kiddies by this point. They were so excited to see what was inside after having to wait so long to open it. We had seven (yes seven) brand new Teletubbies toys inside our box. There was something for everyone, each character was present in some form or another and there was a great selection covering a wide range of ages which was really great. We were happy. 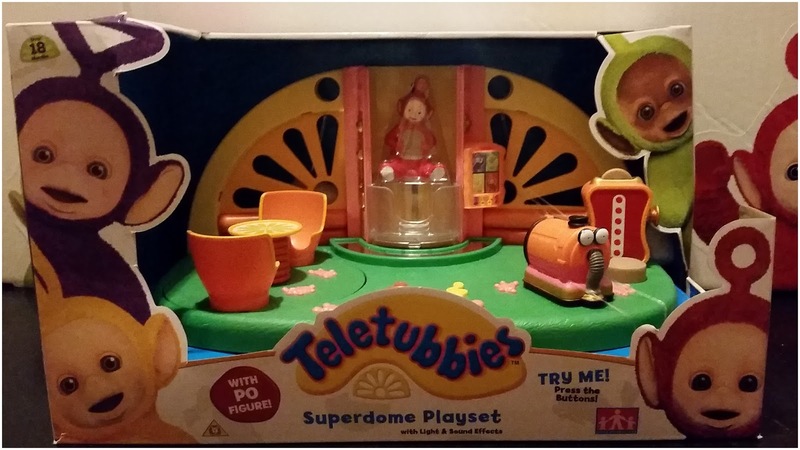 From their World of Plastic range we received their Superdome Playset which is a lovely solid playset which replicates the Teletubbies home. 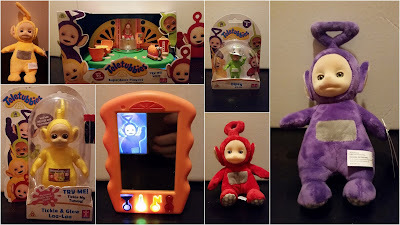 Po and Noo Noo are included which makes play instant, it's always nice when playsets have characters already included. I love solid playsets, they're nice and solid and sturdy for play time. 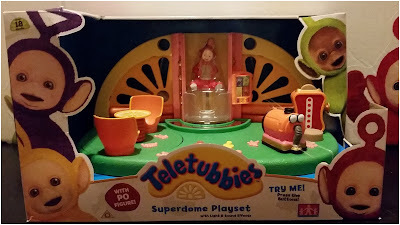 The Superdome playset went down really well with my youngest who loves playing with smaller characters in their own little worlds. Being 5 means he still uses his imagination when playing making this perfect. From their Novelty Plastic range we received their La-La Tickle and Glow figure which was a nice little toy to play with. You simply tickle La-La's tummy with your finger to hear her laugh out loud. Again this is a nice solid toy so it's good for children who have a habit of breaking things apart easily as this shouldn't break easily at all. It's feels quite hard to touch but it's light weight making it suitable for little hands and their rough and tough play style. Also from their Novelty Plastic range we received the Tubby Phone which is a fab little toy. At first I thought it was a baby toy but after a quick play with it I soon realizes that it was much more than that. When it's switched off the phone is a mirror making this a fun thing to play with in itself, I mean what child doesn't like looking at them self in mirrors? Once switched on the toy mirror transforms into a screen which lights up with the different characters pictures on. There's lots of pretty flashing lights and musical sounds on it too. There's 4 buttons on the bottom of it, each one is in the shape of each Teletubbies coloured ariel on their head. Each one brings up a different character, it's a delightful little toy. Again from their World of Plastic range we received their Dispy Collectable Figure who is a very sweet little figurine ready to be collected or played with, whichever you want to really. 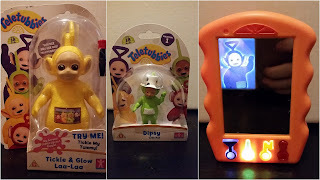 The figures would look great in a collection on your side or make great additions to your Teletubbies playsets as they are roughly the same size and would fit in quite nicely. From their Plush range we received three lovely soft plushes. Po is a super soft collectable who's very soft and loveable. This one is quite small but great for giving hugs. My eldest daughter may be 13 but she loves Po and has claimed this one for herself. Po now sits next to her pillow in her bed just waiting for her to snuggle up at night. The two bigger plushes are talking ones, we have a talking La-La and a talking Tinky-Winky. Both are lovely and soft and come in nice sizes. They say lots of different phrases and sound just like their TV show characters. La-La now belongs to my Lily whilst Tinky-Winky belongs to my boy. All the plushes are lovely, they're bright and soft and super snuggly. I think the plushes are my favourite as they're just so cute and have so many uses. Each of my children now has a new friend to play with, talk to and best of all, sleep with. They're so lovely. 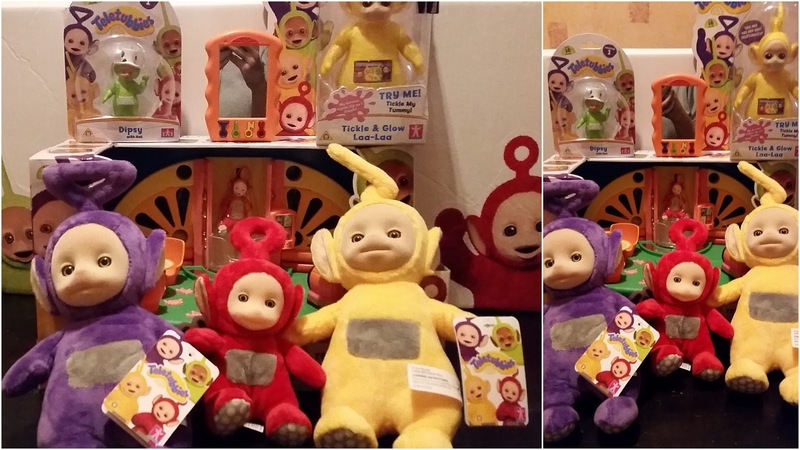 We have had a blast playing with our new Teletubbies toys and have to say that the overall quality of them is really high. They're reasonably priced and hard wearing making them great for all ages (Over 3). There is more new toys in their range but you'll have to go over to the website to take a look or you'll be able to see them all in the shops real soon. From all of us here, the Teletubbies are back and we are so happy about that. 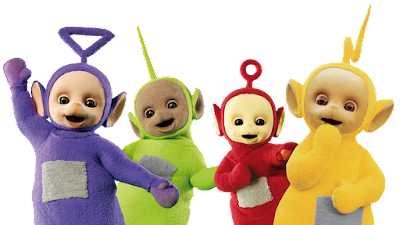 If you're as excited as we are then you'll be even more excited to hear that there's a Teletubbies Twitter Frenzy set to take place on Twitter on Wednesday 20th January at 1pm. You can join in by following @UKMUMSTV on Twitter. There will be lots of prizes to be won and fun and games to join in with. We'll be there and I hope to see some of you too. 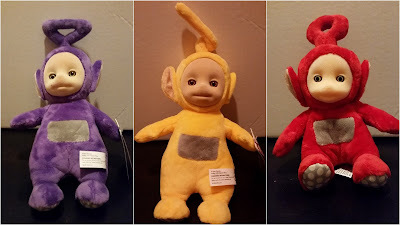 Disclosure: We received our Teletubbies toys as part of a Teletubbies campaign. Our review is an honest account of how we got on, all opinions expressed are my own. The #Teletubbies are Coming .. Watch This Space!